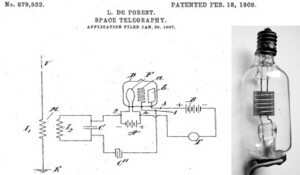 As we saw last week at Hearing international, the road to a working portable electric hearing instrument involved a series of inventions such as the telephone and the carbon microphone before Miller Reese Hutchinson put the parts together and presented the world with a working electronic hearing device. Recall that the carbon microphone was invented in 1878 and by 1896 or so Hutchinson presented his friend Lyman Gould with a working device. 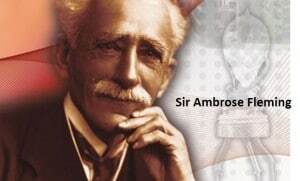 Edison looking at how electrons flowed and Sir Ambrose Fleming inventing a vacuum tube that looked at dots and dashes of Morse Code for Guglielmo Marconi and finally Dr. Lee de Forest’s invention of the three element vacuum tube 1906 called the “grid Audion” which he described as a detector of sound. application of a vacuum tube amplifier to audio frequency receiving circuits. 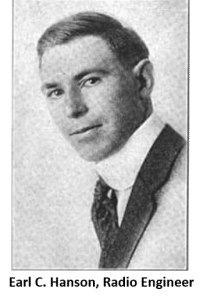 Hanson, a radio engineer, first for the Bureau of Steamships and later for the US Navy, was already the inventor of radio piloting cables for steamships, radio telephones for moving trains and beacons for aero landing fields. 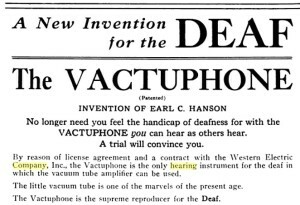 Hanson takes credit for the first vacuum tube hearing aid he called the Vactuphone. Equipped with a single triode vacuum tube, this instrument is a little bigger than an early camera box. collaborative effort between the Western Electric Company and the Globe Phone Manufacturing Company, going to market in October 1921. It was basically a carbon hearing aid using a Western Electric 205-A peanut tube for amplification. 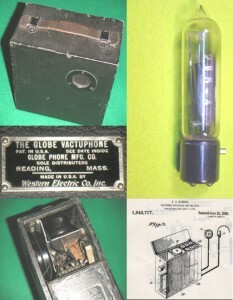 The Vactuphone operated from a 1½ volt No. 6 dry cell “A” battery and a 24 volt “B” battery. These were both contained in a large compartment that opened up in the bottom of the case (see pictures). The earphone is stored in the compartment at the top right. The carbon microphone (black) is visible on the left side, while the volume control is on the right side. It used a telephone transmitter to turn speech into electrical signals. After the signal was converted, it would be amplified when it moved to the receiver (headphone). The cost for a brand new Vactuphone in 1921 was $135. As you can see, the Vactuphone was not worn on the body; it was a “table-top” model. 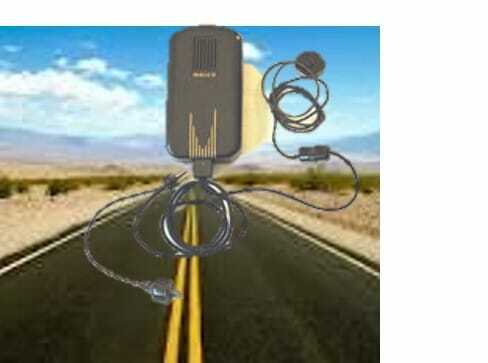 Although a new concept in amplification, the Vactuphone did not take off in the market because it was not very practical. It was large, required lots of batteries and when you were away from the table you could not hear. led to smaller devices and fewer battery needs. Staab (2014) indicates how a vacuum tube hearing aid works, “one part consisted of the amplification electronics, one for the heater of the vacuum tube, and the other supplied power to the vacuum tubes”. 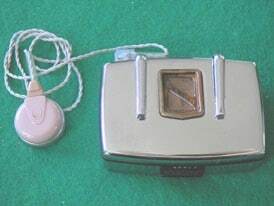 As the vacuum tube and battery technology continued to improve, due to huge research and development efforts during World War II, the instruments got continuously smaller with comparably less battery requirements and by 1942, Zenith introduced the Model 2A “Radionic” hearing instrument, the first wearable vacuum tube hearing instrument. The device was a one piece design. While it still required two batteries, one for the heater and the other to power the instrument, there was better control of volume, tone and other comfort innovations. Transist-ear Model O. Transistor and were less fragile, significantly smaller, and required only a fraction of the battery power of their vacuum tube counterparts. 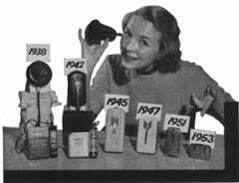 These real benefits to the hearing impaired caused the replacement of vacuum tube hearing aids virtually overnight in 1953. Adams, M. (2012). Lee de Forest: King of radio, Television and Film. Springer. 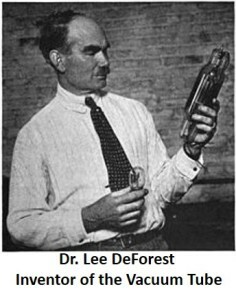 Lee de Forest.org Retrieved July 21, 2015. Center for Hearing Loss Help (2015). The Hearing Aid Museum. Retrieved July 21, 2015. Volta Review (1922). The Vactuphone advertisement. Volume 24, pp.8 Retrieved July 21, 2015. Staab, W. (2014). Hearing Aid Technology Evolution. Hearing Health and Technology Matters. Retrieved July 21, 2015. Haupt, J., (2013). 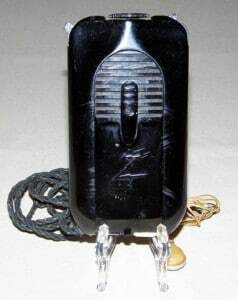 The Zenith Model 2 A “Radionic” Vacuum Tube Hearing Aid. Retrieved July 21, 2015.